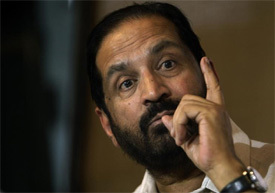 In the wake of recent doping scandal, reports emerged on Saturday suggested former IOA president Suresh Kalmadi is likely to be quizzed by the one-member committee to find out his involvement in the current doping fiasco. The Union Sports Ministry on Thursday had appointed Justice Mukul Mudgal, retired Chief Justice of the High Court of Punjab and Haryana, as a one-member committee to enquire into the doping scandal. Earlier, Sports Minister Ajay Maken had held former AFI president Suresh Kalmadi and former secretary general Lalit Bhanot responsible for the mess the sport is in India. There were several media reports saying that the athletes have been protected after testing positive for banned substances during the tenure of Suresh Kalmadi. The Sports Ministry had set up the committee after eight athletes, including Asian Games double gold medallist Ashwini Akkunji and her gold medal winning 4x400 relay teammates Mandeep Kaur and Sini Jose, flunked dope tests for anabolic steroids.